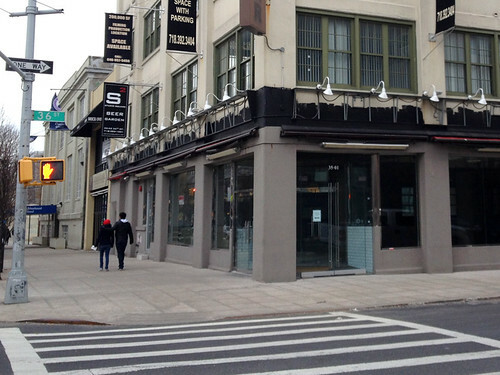 Sad news for my fellow Astorians: 5 Napkin Burger has closed its Astoria location. restaurant space emptied, all signage removed. Although our neighborhood is not lacking for other burger options (we do, afterall, have the amazing veggie burgers at Astor Bake Shop, Bareburger, and Sparrow Tavern! ), I will miss having 5 Napkin's delicious veggie burger and veggie sliders so close to one of my favorite yoga studios. 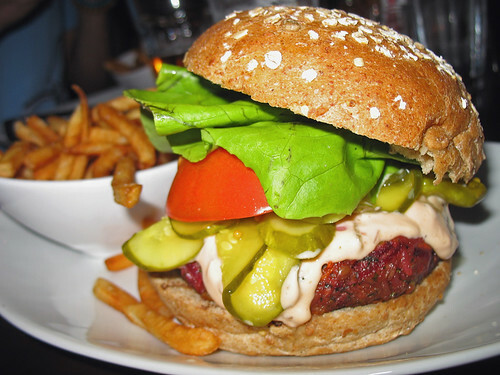 If you still want to try 5 Napkin's 5-star veggie burger, fortunately you can choose from several locations in Manhattan that are still open in Hell's Kitchen, Union Square, and the Upper West Side (addresses listed on their website). Read my original review of this burger here. I know, this made me so sad! They closed so suddenly, but I was lucky enough to have gone a week earlier and had the veggie burger. This was only a block from my apartment and was always a solid place for burger and a beer. Wonder what's going to fill the place, I can only hope it's something just as good or even better! I hope it's something good that sticks around for awhile! I was sad that the old Cup Diner closed, and that weird restaurant that replaced it before 5 Napkin just seemed a waste.